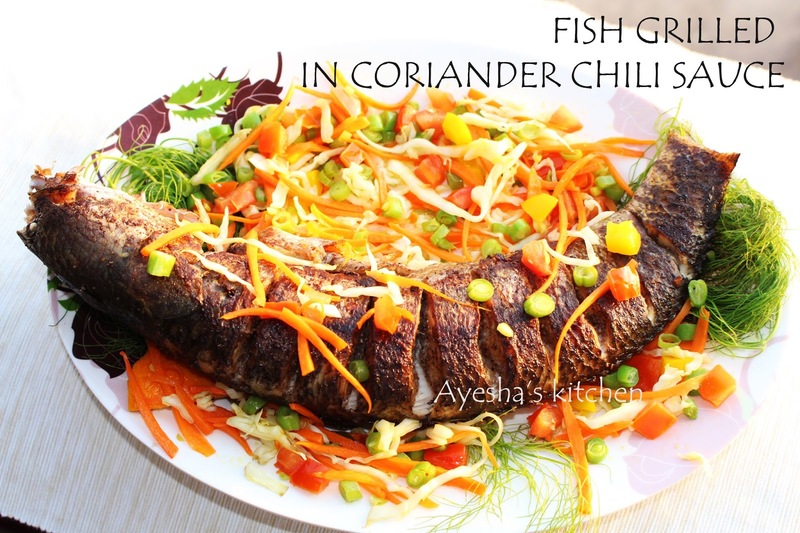 Here is the recipe showing how to grill / bake whole fish with our favorite sauce like garlic chili sauce, sweet sour sauce, coriander chili sauce and so on.. 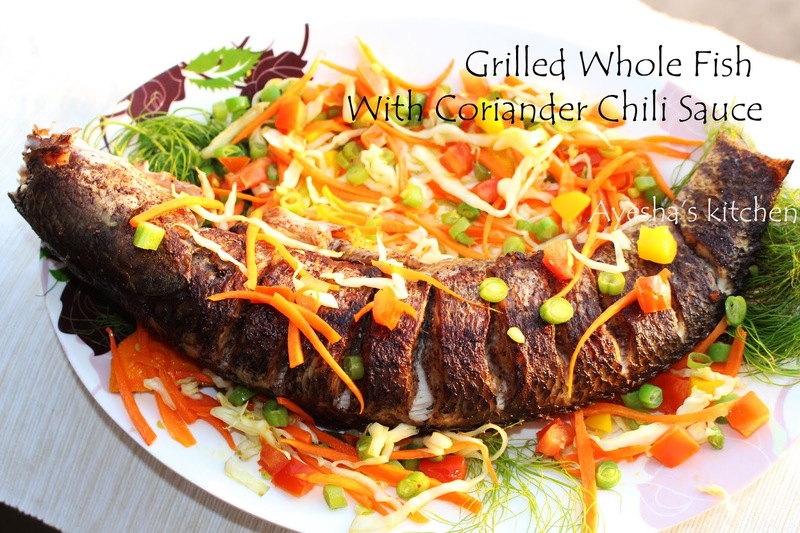 Lets grill with coriander chili sauce as its my favorite combo. This is the traditional thai fish recipe which can be barbecued, grilled indoors or shallow fried / pan fried. This recipe is made both indoors and outdoors in Thai land. Here fresh fish is more preferred than frozen fish for grilling. A variety of white fleshed fish can be used for this recipe. I am sure you all will love the tenderness of the fish with a mouth watering flavor of coriander chili sauce that can be mildly spiced to extra hot according to your taste. As i prefer mildly spiced, the recipe is given to suit my taste only. Combine lemon juice, salt and pepper well and mix it well with oil (adding oil will prevent the fish from sticking to the grill while grilling). Then marinate the fish well both inside and outside. Let it stay for 20 minutes. Grill the fish on BBQ / fry it in a pan with less oil. I grilled it on my Electric grill for 5 minutes each (both sides) or until brownish. While frying / grilling be careful that do not flip the fish too early. Because the skin will stick to the pan. So turn only after few minutes only. Mean while , grind together lime juice, soy sauce, ginger garlic paste, sugar, coriander, chili, fish sauce in a blender. Pour it in a sauce pan . Heat it on a medium flame for about 6 minutes or until thick. Check the taste. Add more fish sauce if less salt and add more sugar if it is too sour. The taste must be tangy. Once done add the grilled fish to it slowly. Cook both sides on a low flame until the gravy is completely stick to the grilled fish. Do not cook the fish more. The time depends on the size and the skin of the fish. While flipping be very careful not to brake its bone or flesh. Once done serve to a plate and garnish with veggies, bell pepper and dill leaves . You can mix the veggies with pepper powder and salt to add flavor.